When or if I have you, I want you to know that you will eat dessert. There will be butter, eggs, sugar and chocolate. There will be nuts, cherries, berries and custard. When you come home from school, you will be presented with homemade chocolate ice cream. When you come in from soccer practice, I will feed you oatmeal cookies. And, you must eat them now because they're fresh and warm from the oven! And you must eat it all because wasting is bad and I have to teach you morals. So don't pout, just eat your dessert! Finished supper? Great! 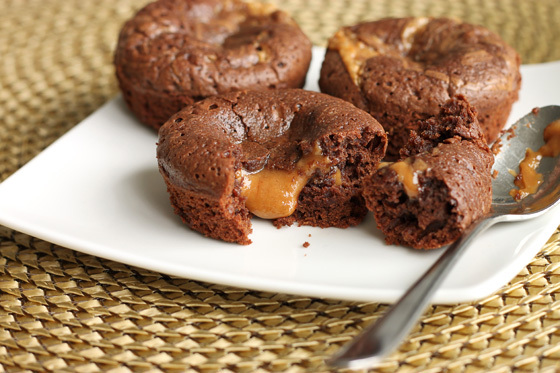 Have one of these Molten Peanut Butter Caramel Brownie Cakes. Your meals will be healthy and nutritious, but there will be dessert. Fruit will make an appearance so other mom's don't think I'm terrible, but it will still be dessert. If you are fat, it will probably be my fault. 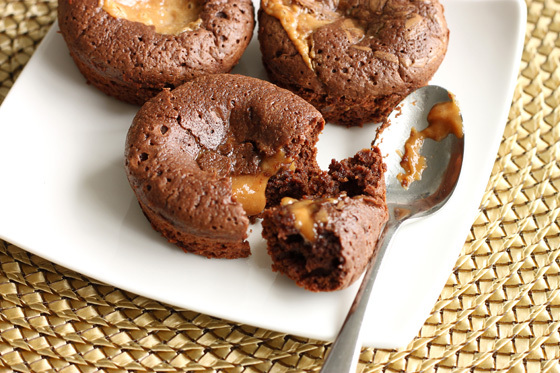 These Molten Peanut Butter Caramel Brownie Cakes are nuts. They're just insane. 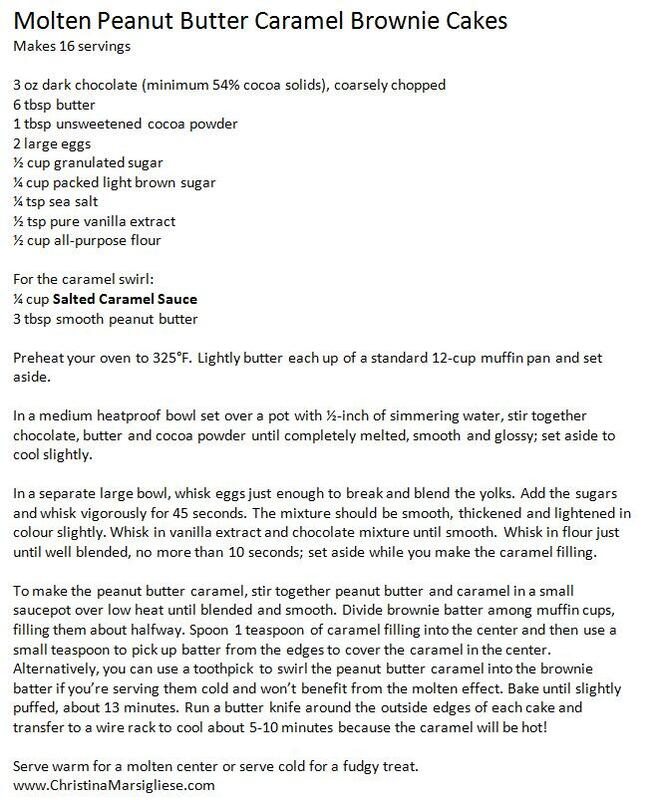 The molten filling is made by combining this salted caramel sauce with creamy peanut butter. Serve these guys warm for a gooey center. Or, cool completely and then refrigerate until thoroughly chilled - this makes them super dense and fudgey. Baking them quick in a heavy duty nonstick muffin pan is the key to keeping them extra gooey in the middle. I hope you pack this in your son's/daughter's lunch box. They will freak out. Then, when they get home, send them out to do six laps around the block. @Victoria (The District Chocoholic) I never said to eat only one. 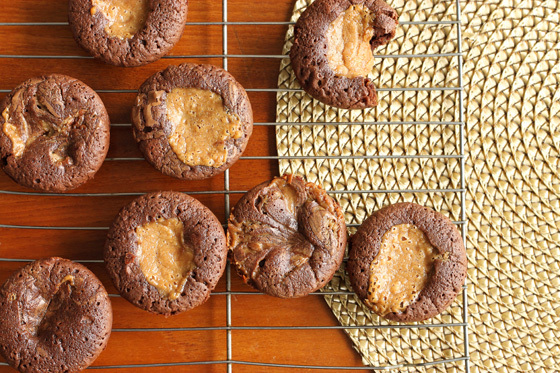 mmm peanut butter, chocolate, and gooey caramel, one of the best baking combos! Looks so yum! They look super tasty it is everything wonderful in one package YUM! It's like what a reese's peanut butter cup dreams it wants to be when it grows up. looks delicious! This is simply too much for my little heart to handle. It's beating so fast right now, longing for that ooey gooey caramel! Wow! Looks wonderful! Yummy! I wish I had one or two now. Haha! You can adopt me! I'll be your kid and willing stuff my face with your dessert! ;-) Love this recipe so much I can't even describe it! YUM! Very cute, well done and enjoy eating them. Wow these look delicious! You've totally given me a chocolate/peanut butter craving. Oh my goodness. Those look amazing! What better combo could there possibly be than peanut butter, caramel and chocolate? I'm bookmarking this for sure! Wow my mouth is watering! I love that peanut butter that is oozing out of the middles of those cakes. Amazing! I wish I were your future child as well! I guess I will just have to deal with reality and make these delicious brownies for myself. Oh wow, I am drooling. Salted caramel sauce plus peanut butter surround by chocolate cake? Yes please. Ohh this is mouthwatering!!!! I love the peanut butter oozing out of the brownie cakes..yummy!!! I love the letter. That is something I would tell my daughter. Great recipe. I made these on Friday night.... DANGEROUS!! LOL! Lemme just say that there are only 2 of these seductive decadent brownies left... after two days. So I have been looking for something to make for all my husbands med school classmates as a back to school treat and I think I just found it! These look amazing! @Beth Michelle Those are going to be some lucky med students. Would just adjusting the baking time be reasonable if I make these in the muffin pan that's bigger than the standard pan though not the biggest? I believe they hold just about twice the amount of a standard pan filled 2/3 full. Thanks in advance! How do they hold up if baked ahead and served within 24 hr or so? Yes I would just increase the baking time slightly. Baking them in a larger muffin pan will actually give you a more molten center (sweet!). And they hold up very well - the next day they become more fudgy, but once they cool you will no longer have the molten effect.